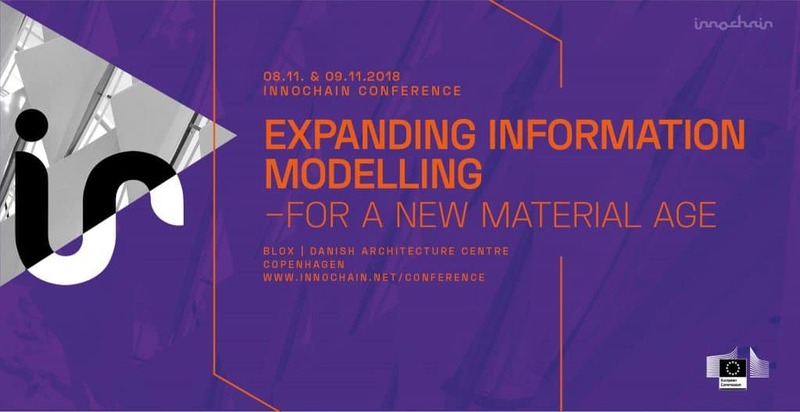 InnoChain invites you to the international conference Expanding information modelling for a new material age. It will take place in Copenhagen on 8-9 November 2018 at the Danish Architecture Centre in the new Blox building by OMA. The conference is organised in collaboration with the Danish BLOXhub organisation and aims to create a forum for transdisciplinary and entrepreneur driven research. The InnoChain Final Conference will present the leading examples of this hybrid design practice focusing on innovative projects from practice and research that highlight strategies and tools for interdisciplinary collaboration, advanced design optimisation and material rethinking. These projects are aimed at connecting early design thinking with structural and material analysis and engaging interdisciplinary design innovation. Part of the conference is based on case presentations about innovative projects. A wide range of results will be showcased from new types of collaborations between “research in practice” and “research in academia” through working on buildings, constructions, design and data model. IAAC will be present in this event with the participation of IAAC’s Academic Director Areti Markopoulou, who will be a key-note speaker in a panel discussion together with architect Philip Yuan, our Head of Studies Mathilde Marengo, in charge of chairing the session “Material Strategies”, and our PhD candidates in the InnoChain Network Stephanie Chantiel and Angelos Chronis.